Well, the Maramarua Classic is done and dusted, well it could have been dusted if the rain had held off, but you have probably heard by now that it did not. At 3pm on Saturday the mark out crew were congratulating ourselves on a job well done and a perfect dry track when dark clouds began to form over the forest. What followed was two hours of biblical rain, building an Ark was a possibility. We put our gear back on and went out, modifying the course until dark. To compound things at 8.00am on the day of the ride the heavens opened again with solid rain that lasted until the sun came out around lunchtime. To say it was wet and muddy was an understatement, however 30 competitors and 7 trailriders fronted and took on what were very difficult conditions for bikes and riders of any age. Congratulations to them all, they gave it everything in the spirit of true vintage enduro enthusiasts. Nineteen of the competitors made the 75 km to the finish in either Gold or Silver grades, with the all the riders having to climb some pretty stiff climbs, the Gold riders more so. Though it was gutsy riding all round some riders really stood out on the day, usual rivals Craig Brown and Dene Humphrey smashed the conditions on their Evo 1 IT and PE enduros, while Stephen Groves seemed unfazed by the conditions on his heavyweight Classic XL350 trail bike, and Adam Pogson showed how effective a 125 motocross bike can be in Vinduro. There were many other notable rides, but to mention two - just turned 17 years old Josaia Trostel, a high school student studying in NZ rode with an ear to ear grin and finished his first ever enduro on an XL250 Motosport, while Richard van de Ruyt persisted to complete the course on a stock twin shock DT175, still resplendent with indicators, speedo and tachometer! Maramarua was the fifth Vinduro run in NZ and the first wet event, something that was going to happen eventually. It did show however that with Gold and Silver grades and willingness from the organiser to be flexible with the course, and the riders to knuckle down, a wet enduro can still be fun. Thanks also to Power Adventures for all the hard work of hosting the event at Maramarua. 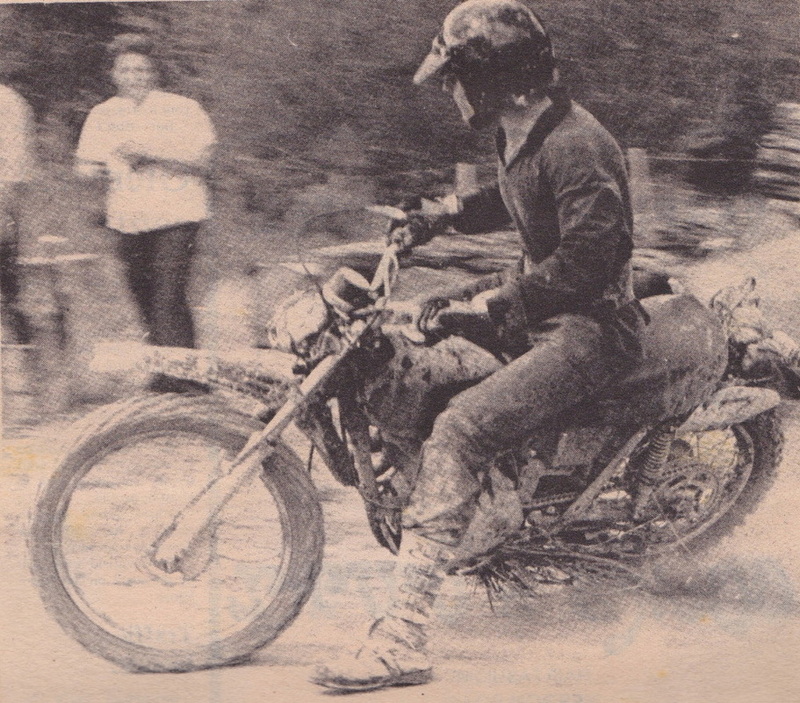 Jo Van Lier, at the 1975 Maramarua Enduro on his Honda XL350. Auckland MCC stalwarts Bob Jackson, Kevin Sargent and Bevin Allison et al kicked off the Maramarua Enduro in 1975 attracting a healthy 83 entrants. Winner of the event was Phill Thompson on a Yamaha TY250 trials bike. The classic Maramarua Enduro was one of NZ's iconic Enduros, run on several occasions as a two day event. From the early 70s Maramarua Enduro was usually run in mid winter and was one of the events that all NZ riders measured their skills against. For 1976 Marmarua was a full-blown 2 day event. The Auckland MCC went all out with the course and promotion including a midweek number draw at the clubrooms conducted with great gravity. Conditions on day one were hard and fast with 75 winner Phill Thompson leading on a modified Honda TL250 trials bike complete with longer travel suspension, full seat and enduro tank. The second day was a contrast after heavy overnight rain made it a battle to the finish on a course that included several seriously steep hills and a couple of swamps that could only be crossed by pushing the bikes through thigh-deep swamps. Throughout the seventies and eighties Maramarua continued to be part of the NZ and North Island Enduro Championships. By the late eighties enthusiasm within the organising group of riders had waned and the event and riding within the forest went into recess. In recent years Power Adventures have made the forest their base and Greg Power and his team have created an extensive system of tracks maintained and groomed by machine. Most of that programme involves trail riding, but modern competition enduro and cross country events are also run. For more on early Maramarua Enduros go to the NZ Enduro History section.